NOTE: You can NOT mix and match. To get the discount you need to get the required amount of a single product. 90 Watts: 25% brighter than older versions of the 360. Effective light much greater than a 250 watt metal halide. Note: 90 watts is the maximum output. The output will be less if you turn down the blue or white LEDs. The Kessil A360W Wide Angle Tuna Blue LED Aquarium Light works seamlessly with the Kessil Spectral Controller to control the intensity and color mix of the light throughout the day and night. This version is designed for use with reef aquariums. For freshwater planted tanks you can use the Kessil A360WE Wide Angle Dimmable FRESHWATER Aquarium CONTROLLER READY Tuna Sun 90 Watt LED. The A360WE still has the two knobs, just like the A350W. But instead of one knob controlling the blue LEDs and the second knob controlling the white LEDs, one knob is used to control overall intensity and the other knob the blue/white LED spectrum mix. You can tune a preferred color within the spectral range thousands of research and testing hours determined to be the optimal spectral points. This Wide Angle Model has a beam spread of 70 degrees vertically (140 degrees edge-to-edge) and is recommended for larger tanks that are relatively shallow (e.g. frag tanks), and for very large swim tanks. The A360WE Tuna Sun utilizes the “Double Peak” Technology used in Kessil’s Horticulture line and produces wavelengths that mimic the sun, and provide for the increased photosynthetic absorption. The Tuna Sun has Kessil Logic, which allows the color to be changed while maintaining the intensity of light. This Wide Angle Model has a beam spread of 70 degrees vertically (140 degrees edge-to-edge) and is recommended for larger tanks that are relatively shallow. The Kessil A360NE Narrow Angle Tuna Blue LED Aquarium Light is designed for reef aquariums. The Narrow Angle focus is the best choice for tanks over 24" deep. It works seamlessly with the Kessil Spectral Controller to control the intensity and color mix of the light throughout the day and night. It can be easily hung above the tank with the two built in mounting tabs (that can be attached to a hanging mechanism), or can be clamped to the tank with the Kessil LED Light Pendant Gooseneck Clamp/Mount. The A360NE is also designed for use with the Kessil Spectral Controller, Neptune Apex Controller (the Apex Jr. & Apex Lite will require the VDM Module) and the ReefKeeper Controller (with the ALC Module). With the A360NE and a Neptune Apex Controller (with the Kessil Apex Controller Cable) or a ReefKeeper Controller (with a Kessil ReefKeeper Controller Cable) you can control both the intensity and the color temperature of the Kessil A360NE. This will require two control channels on the Apex. Kessil A360NEs can then be daisy-chained together (with the Kessil Daisy-Chain Cable) and controlled from a single Apex Controller. Even without using the Kessil Spectral Controller or the Apex Controller, the A360NE improves on the A350N. The A360NE is brighter than the A350N. The A350N loses intensity when you turn down the blue or white intensity knobs. The A360NE is 55% brighter when just using either the blue or white LEDs. When all the LEDs are on full the A360NE is 25% brighter than the A350N. The A360NE still has the two knobs, just like the A350N. But instead of one knob controlling the blue LEDs and the second knob controlling the white LEDs, one knob is used to control overall intensity and the other knob the blue/white LED spectrum mix. You can tune a preferred color within the spectral range thousands of research and testing hours determined to be the optimal spectral points. The Kessil A360NE Dimmable Tuna Blue 90 Watt LED Light brings out the vivid colors of corals with the specially created spectrums of the A360 E Series. While it is hard to compare the Kessil to 250 Watt metal halide lights, the 90 Watt Kessil has a greater effective light spectrum for corals than a 250 Watt metal halide. This is partly due to the efficient use of electricity with LEDs, partly a function of higher percentage of the light being directed downward and partly because a very high percentage of the light spectrum with the Kessil A360 Dimmable Tuna Blue 90 Watt LED Light is useful to corals. The Kessil A360NE will result in thriving corals with lower electricity bills, less of a need for a chiller and no bulb replacement costs. The lightweight Kessil light, which weighs just over a pound, can be easily hung above the tank from with the two built in mounting tabs (that can be attached to a chain or other hanging mechanism), or can be clamped to the tank with the Kessil LED Light Pendant Gooseneck Clamp/Mount. This Narrow Angle Model is the best choice for tanks over 24" deep. The Kessil A160WE Tuna Sun FRESHWATER LED Light Fixture CONTROLLER READY adds the functionality of the A360WE Kessil lights to the A150W lights. The A160WE comes with two control knobs. One knob is used to control overall intensity and the other knob the 6,000K/9,000K LED spectrum mix. You can tune a preferred color within the spectral range thousands of research and testing hours determined to be the optimal spectral points. In addition, you can control the A160WE with the Kessil Spectral Controller (a separate purchase). This version is designed for use with planted aquariums. For reef aquariums you can use the Kessil A160WE Tuna Blue LED Light Fixture. The Kessil AP700 leverages the technology of Kessil's award-winning pendant lights and expands it into a larger, 185-watt panel platform. With two 60-LED chip arrays, the AP700 delivers up to 4 feet of coverage. This powerhouse is also equipped with built-in Wi-Fi for even greater control and customization. The Kessil AP700 features a flawless touch control panel to easily adjust intensity, color and cycle through preset program modes. The intuitive system allows instant customization of an aquarium with just a simple touch. The built-in WiFi capability takes control even further, with the power to remotely program the AP700 through the Kessil AP700 app. Using the Kessil app, custom lighting schedules will take full advantage of the AP700's features, whether it is a dawn/dusk effect or moonlight mode. The iPad app is now available from the App Store, and the with iPhone and Android versions to follow shortly. See the VASCA AP700 iPad App Video for details. 20.08" X 6.38" X 1.54"
For the Kessil A80 there is an optional Mini Gooseneck with a shorter 'neck' to accommodate this smaller light and smaller tanks. The Kessil Spectral Controller introduces an easy to use control option for the aquarium community. Just the size of a smart phone, the Spectral Controller has the ability to tune up to two different sets of Kessil A360, A160 and A80 lights via two separate output ports (0~10V). Designed to look great alongside Kessil lights. To connect to more than one light you will need an extra Kessil Unit Link Cable for each additional light. A single Cable comes with the Spectral Controller. You can connect an unlimited number of lights to the Spectral Controller if you have a Daisy-Chain Cable linking the lights together. The Controller X comes with one K-Link port and one 0-10V output port. The K-Link port allows users to connect to the new A360X, while the 0-10V port is for Kessil’s 0-10V light fixture (A360WE, A360NE, A80 and A160). You will need another K-Link Cable with each additional light. With the 0-10V port you need to use the older Unit Link Cable (not included with Controller X). Kessil H380 LED Refugium Grow Light is a horticultural light that is fine tuned for photosynthesis and uses the same platform as the Kessil A360. 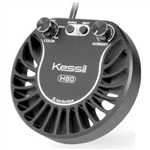 There are no white LEDs in the Kessil H380, just blues and red in the right proportion to stimulate the chlorophyll of plants, be it plant clones from a garden, or marine plants. So if you’ve got a little macroalgae or turf algae scrubber, the pinkish light should fuel the most growth and export the most nutrients of any comparable white refugium light. Coverage is up to 36" deep & 24" wide. Can be mounted to the underside of a canopy with the top mounted adapter or attached to the back of a tank with the Kessil LED Light Pendant Gooseneck Clamp/Mount. One fixture contains two unique full-spectrum blends with UV light. Each spectrum caters specifically to a phase of plant growth so one fixture is all you need (see spectrum charts below). Kessil H160 Tuna Flora LED Refugium Grow Light is a horticultural light that is fine tuned for photosynthesis and uses the same platform as the Kessil A160. There are no white LEDs in the Kessil H160, just blues and red in the right proportion to stimulate the chlorophyll of plants, be it plant clones from a garden, or marine plants. So if you’ve got a little macroalgae or turf algae scrubber, the pinkish light should fuel the most growth and export the most nutrients of any comparable white refugium light. Coverage is up to 24". The H160 Tuna Flora features four efficient spectrums - BLUE, GROW, BLOOM, RED - in one single fixture. The light is perfectly blended, with wavelengths including true UV and Infrared (ranging from 360-780 nm), enhancing photosynthetic efficiency. See the wavelength charts below. The Kessil LED Light Pendant Gooseneck Clamp/Mount is a versatile mounting option that allows you to customize the positioning of your Kessil LED Fixtures. 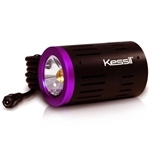 Will work with all Kessil lights we sell (A150W, A160W, A360W, A360N, A350 & A350W). It includes a mounting bracket for the 350 & 360 lights. The A160W comes with a mounting bracket. If you have an older A150W it may or may not have come with a mounting bracket. If you need a mounting bracket for the A150W, ask for one in the order comments. We recommend also ordering the Kessil LED Light 90 Degree Gooseneck Adapter or the Kessil X-Series LED Light 90 Degree Gooseneck Adapter. The Kessil Unit Link Cable can be used to connect together unlimited Kessil A360 & A160 LED Lights. For the A80 the Kessil A80 Unit Link Cable, 90 degree connector is recommended. All the lights daisy-chained together can be controlled by a single Neptune Apex Controller (or Apex Jr. & Apex Lite Controllers with the VDM Module). If you're using the Kessil without a controller the first light in the chain will control the dimming and spectrum for subsequent lights. 6 feet long. 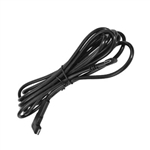 To extend this cable you can use the Kessil Extended Unit Link Cable. Kessil, this cord is 6 feet long. This will work with all A350 Kessil LED Lights. 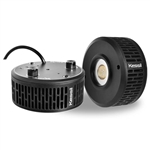 The Kessil AP700 LED Aquarium Light Hanging Kit is easy to assemble. Each cable is eight feet long. The Mounting Arm height is adjustable. For the AP700 the bottom of light can be up to 16 inches from the top of the water. For all other Kessil lights the bottom of the light can be up to 13 inches from the top of the water. The Mountain Arm can be adjusted horizontally. For the AP700 the center of the light can be anywhere from 9.5 to 12 inches into the tank. For the other Kessil Lights it can be from 11 to 13.5 inches into the tank. 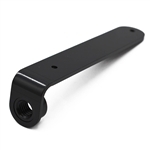 For wider tanks (front to back) from 25" to 32" (where you want your light at the halfway point of 12.5" to 16") you might also wish to purchase the Kessil Slide Bar-2 Extended Slide Bar for Mounting Arms. When using the Plastic Steppers (spacers) the tank and tank lip can not be more than 1/2". Without the Plastic Steppers the tank and the tank lip can be up to 1". The Kessil AP700 Slight Diffusion Optical Kit enhances the Kessil AP700's already great color mixing while reducing shading by scattering the light at a wider angle. The attachments also allow the user to subdue the shimmer without reducing flow while maintaining the natural shimmer lines. The Optical Kits are great for acclimating new corals to the Kessils. The silicone construction ensures a long lifespan while built-in magnets make attaching and removing the Optical Kits simple. No tools are needed. If you have a deeper tank, little surface agitation, or only want to soften the point source light a little bit, then this Slight Diffusion Optical Kit is the one to consider. The Major Diffusion Optical Kit is probably best for shallower and broad tanks where you want to get even more light spread, softer shadows, and lessened shimmer lines from a turbulent water surface. The Kessil AP700 Major Diffusion Optical Kit enhances the Kessil AP700's already great color mixing while reducing shading by scattering the light at a wider angle. The attachments also allow the user to subdue the shimmer without reducing flow while maintaining the natural shimmer lines. The Optical Kits are great for acclimating new corals to the Kessils. The silicone construction ensures a long lifespan while built-in magnets make attaching and removing the Optical Kits simple. No tools are needed. This Major Diffusion Optical Kit is probably best for shallower and broad tanks where you want to get even more light spread, softer shadows, and lessened shimmer lines from a turbulent water surface. If you have a deeper tank, little surface agitation, or only want to soften the point source light a little bit, then the Slight Diffusion Optical Kit is the one to consider. 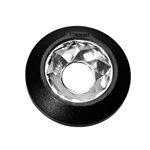 The Kessil LED Light Pendant Mini Gooseneck Clamp/Mount is a versatile mounting option that allows you to customize the positioning of your Kessil A80 LED Lights. The Extension Mount comes with two extension tubes. If used with the A160 or A360, the two included Extension Mount Tubes when used with one AP700 Mounting Arm and connected together will provide a total distance of 56 inches from the top of the light to the bottom of the Extension Mount. With the AP700 there are two mounting arms, and the two included Extension Mounts will only extend to 37 inches. 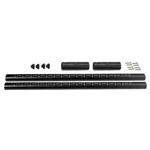 To extend to 56 inches you will need to purchase two sets of Extension Mounts. The Quick Start Guide explains the assembly.